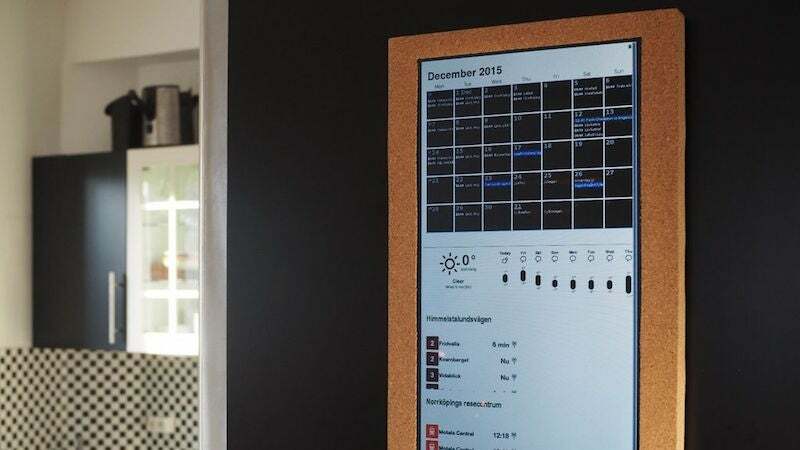 We've seen a Raspberry Pi combined with a cheap LCD screen to create a smart calendar before, but Instructables user ozua takes it a step further with a family agenda, weather forecasts, local events, and even live transport info. The basics here are actually pretty straightforward. The Pi is turned into a web server that run a custom homepage. That homepage pulls in all kinds of live data about the weather, public transportation, and whatever else you need alongside a shared calendar that anyone in the house can access. Beyond that, there's an old LCD from a laptop that mounts to the wall with some custom buttons, and that's about it. The web page aspect of it makes it super easy to modify to suit your needs, so even if it's not exactly what you're looking for, you should be able to tweak it as needed. THIS I would buy. Instead of wasting millions on smart watches, why can't companies produce something like this?